Cook, Tim. (2007). At the Sharp End: Canadians Fighting the Great War, 1914-1916. Viking Canada, Toronto. Davis, Edward. (2003). “The Mesopotamian Front!” Armor. L.J. Daugherty Ed. Harding, Colin. Science and Media Museum, The Vest Pocket Kodak Was the Soldier’s Camera. Hart, Peter. (2013). The Great War. Oxford University Press, New York. Hibbard, D. (2002). Wilfred Owen: A New Biography. Holborn, Mark and Hilary Roberts. (2013). 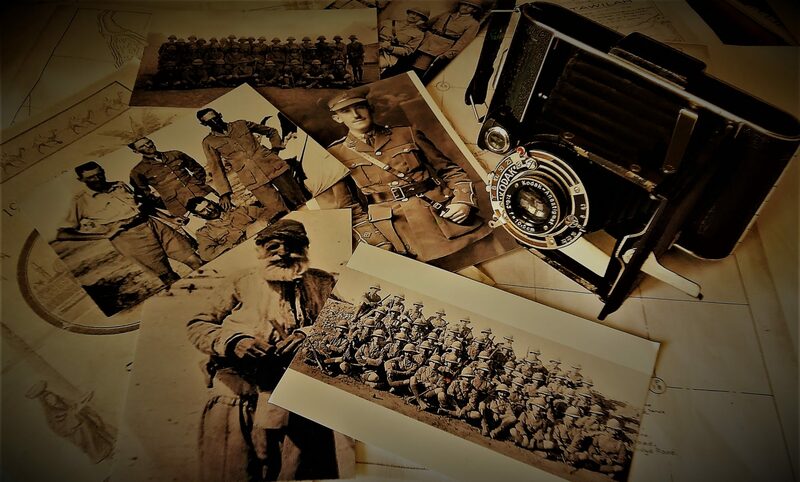 The Great War: A Photographic Narrative. Alfred A. Knopf, New York. Hughes-Wilson, John, Steel, Nigel and Mark Hawkins-Dady. (2014). The First World War in 100 Objects. Firefly Books, Richmond Hill, Ontario. Iarocci, Andrew. (1976). Shoestring Soldiers: The 1st Canadian Division at War, 1914-1915. University of Toronto Press, Toronto. McMeekin, Sean. (2015). The Ottoman Endgame: War, Revolution, and the making of the modern middle east, 1908 – 1923. Rogan, Eugene. (2015). The Fall of the Ottomans:The Great War in the Middle East. Basic Books, New York. Pulsifer, Cameron. (2001) “Canada’s First Armoured Units: Raymond Brutinel and the Canadian Motor Machine Gun Brigades of the First World War,” Canadian Military History: Vol. 10: Iss. 1, Article 5. Taylor, A.J.P. (1985). The First World War: An Illustrated History. Viking Penguin, New York. War Speeches by British Ministers 1914-1916. (1917) T. Fisher Unwin Ltd., London.